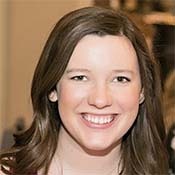 Emily Clark is the Design Den Coordinator at the Mayborn Museum. Emily grew up in Joshua, TX and moved to Waco in 2009. She holds a Bachelor of Science in Biology and a Master of Arts in Museum Studies, both from Baylor University. Emily joined the Mayborn Museum staff in May 2016 to help open Design Den, a new making and tinkering exhibit space. Since then, Design Den has become an important part of educational offerings at the Mayborn. Design Den hosts special programs, summer camps, and outreach programs that encourage participants to make, tinker, and create using art, science, and technology. Emily has presented at professional conferences around the state including the Texas Association of Museums Annual Conference and the Informal Science Educators Association Annual Conference and she works closely with national organizations, including Maker Ed Initiative and the Teen Science Café Network. Emily helps to teach professional development for educators at the Mayborn Museum and hopes to help grow professional development opportunities that equip teachers in the Central Texas area to bring making and tinkering into their classrooms.